Dole Fresh Vegetables is the largest refrigerated produce warehouse of its kind in the world. Lying at the mouth of the fertile Salinas valley, this fully computerized automated facility delivers premium quality fresh produce to customers throughout the United States and Canada. Speed and efficiency are very important when processing and handling fresh vegetables. It is vital to move the products from the field to the customer as quickly as possible to prevent spoilage. The original system Dole was using to pick single case items was not performing to their expectations. They asked FloStor if they could provide a solution. The system actually begins in the field where harvest crews identify each pallet with a nine-digit bar code. Information supplied on the bar code includes product, pack type, field and patch location, the grower's name, date and time of harvest, the harvesting crew and foreman's name, and even the name of the trucker who hauls it from the field to the warehouse. This allows Dole to backtrack the product, not only to the grower, but also the field from which it came. This tracking system keeps a record of each pallet from fields to the market. Once produce arrives at the Marina facility, each pallet is quickly cooled to remove field heat and reduce temperature for best quality and maximum shelf life. 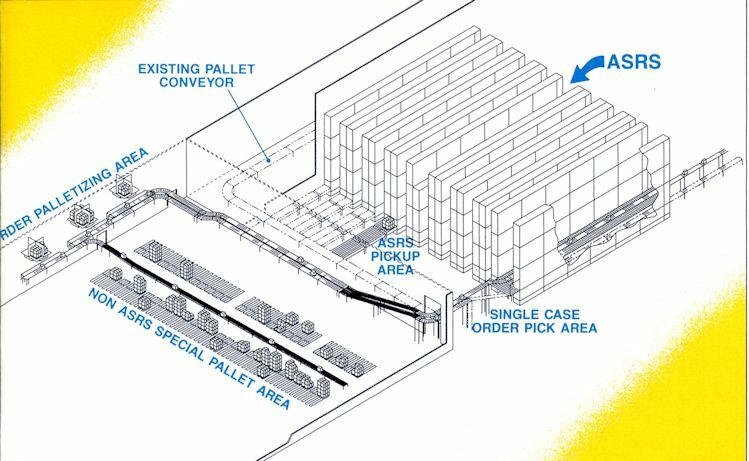 Pallets of produce are stored by an ASRS (Automatic Storage and Retrieval System). When an order is received, it is removed from the ASRS and sent to shipping. Although most orders are full pallet loads, many are mixed orders. In this case, single cases are picked in the ASRS area and placed on a package handling conveyor. These boxes travel to a special palletizing area where orders are consolidated. Prototype pickup stations were implemented for hardway conveying (i.e. pallet slats in worst positions) and to prevent pallets from slipping and skewing as they are transferred toward the cranes because the drag chain is positive compared to the previously used roller conveyor. 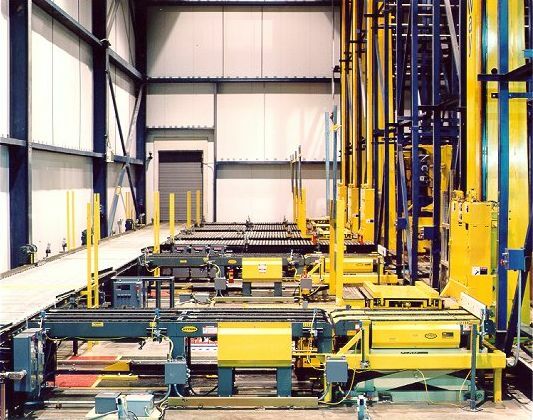 These stations also lower the pallets onto structural steel pallet supports for a stable crane interface compared to lifting the load off a conveyor. The Dole system frequently operates 24 hours per day. This fact alone made it necessary to have the highest quality equipment available to maintain output and keep customers satisfied. The primary conveyors used in the system are belt conveyors and accumulating conveyors equipped with Interroll rollers. Certain pallet loads of items come from other areas, are not bar coded and cannot be loaded into the ASRS. These are placed on gravity flow pallet rails by a lift truck. From these pallets cases are picked and placed on the roller bed conveyor which goes outside with the other lines. This system is located in cold Room B, a room adjacent to the ASRS room. Several important improvements have been realized since implementing the system. Efficiency at Dole is measured by the time it takes to load a truck, from the time it arrives until it departs. This time has been cut by approximately one-half (from 120-140 minutes to about 75 minutes). Also, the new equipment has certain options which allow the equipment to withstand the 24 hour a day operation and deal with the large amounts of moisture in the cold rooms. Photo-eyes supplied with the original system had a fogging problem caused by cool, moist air. To solve this problem Dole added a resistance heating element to the photo-eye. 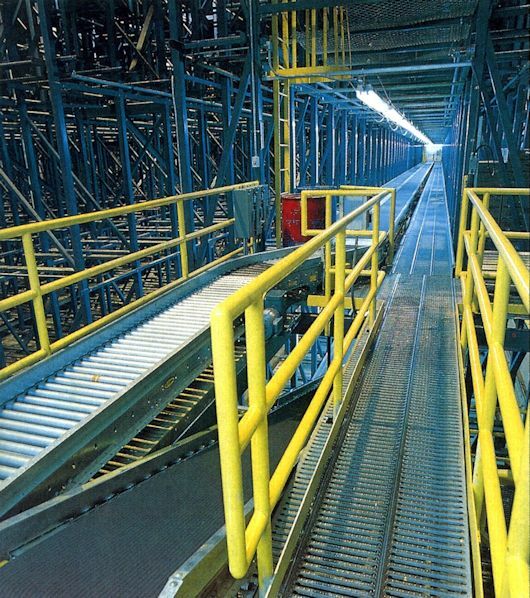 When the new conveyors were installed, however, new heated photo-eyes and reflectors were supplied. Our ROI is most dramatically seen from a labor standpoint. We have a pretty good indication that our returns are going to be generated by pick labor efficiency. We are running with half the pick labor we used to have. So, our pick labor efficiency has gone up 50%. Other things, like improved customer service, are harder to qualify, but they certainly are important.